The model - news of this model was announced on 3rd November 2008 and it was released in Hong Kong on 6th November. 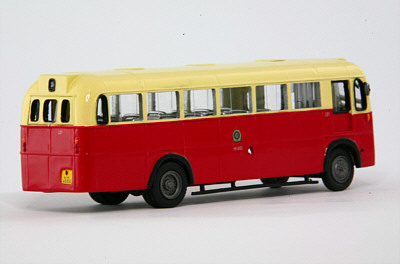 This model represents the vehicle in the 1980's, with folding doors having replaced the sliding gates. The bus - Kowloon Motor Bus ordered 100 Albion Victors in 1960 and these were delivered during 1961, the bodywork being assembled in Hong Kong having been shipped ckd (completely knocked down) as kits from British Aluminium Co. Ltd, England. They were originally fitted with tubular sliding gates but in the 1970's, during refurbishment, folding doors were fitted and the front radiator grille modified. 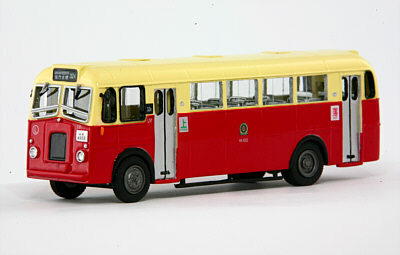 'Hong Kong Buses - Volume 2 - Kowloon Motor Bus'. Prototype bodywork British Aluminium Co.